The second Eucharistic miracle of Siena has roots in the 13th century when special services and festivities were introduced in honor of the feast of the Assumption of the Blessed Virgin Mary. These observances became traditional and were still conducted at the time of the miracle. So it was that on August 14, 1730, during devotions for the vigil of the feast, while most of the Sienese population and the clergy of the city were attending these services, thieves entered the deserted Church of St. Francis. 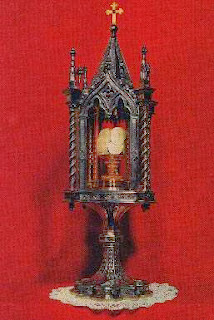 Taking advantage of the friars' absence, they made for the chapel where the Blessed Sacrament was kept, picked the lock to the tabernacle and carried away the golden ciborium containing consecrated Hosts. The theft went undiscovered until the next morning, when the priest opened the tabernacle at the Communion of the Mass. Then later, when a parishioner found the lid of the ciborium lying in the street, the suspicion of sacrilege was confirmed. The anguish of the parishioners forced the cancellation of the traditional festivities for the feast of Our Lady's Assumption. The Archbishop ordered public prayers of reparation, while the civil authorities began a search for the consecrated Hosts and for the scoundrel who had taken them. Two days later, on August 17, while praying in the Church of St. Mary of Provenzano, a priest's attention was directed to something white protruding from the offering box attached to his prie dieu. Realizing that it was a Host, he informed the other priests of the church, who in turn notified the Archbishop and the friars of the Church of St. Francis. When the offering box was opened, in the presence of local priests and the representative of the Archbishop, a large number of Hosts were found, some of them suspended by cobwebs. The Hosts were compared with some unconsecrated ones used in the Church of St. Francis, and proved to be exactly the same size and to have the same mark of the irons upon which they were baked. The number of Hosts corresponded exactly to the number the Franciscan friars had estimated were in the ciborium -- 348 whole Hosts and six halves. Since the offering box was opened but once a year, the Hosts were covered with the dust and debris that had collected there. After being carefully cleaned by the priests, they were enclosed in a ciborium and placed inside the tabernacle of the main altar of the Church of St. Mary. The following day, in the company of a great gathering of townspeople, Archbishop Alessandro Zondadari carried the Sacred Hosts in solemn procession back to the Church of St. Francis. During the two centuries that followed it has sometimes been wondered why the Hosts were not consumed by a priest during Mass, which would have been the ordinary procedure in such a case. While there is no definite answer, there are two theories. One explanation is that crowds of people from both Siena and neighboring cities gathered in the church to offer prayers of reparation before the sacred particles, forcing the priests to conserve them for a time. The other reason the priests did not consume them might well have been because of their soiled condition. While the Hosts were superficially cleaned after their discovery, they still retained a great deal of dirt. In such cases it is not necessary to consume consecrated Hosts, but it is permitted to allow them to deteriorate naturally, at which time Christ would no longer be present. To the amazement of the clergy, the Hosts did not deteriorate, but remained fresh and even retained a pleasant scent. With the passage of time the Conventual Franciscans became convinced that they were witnessing a continuing miracle of preservation. Fifty years after the recovery of the stolen Hosts, an official investigation was conducted into the authenticity of the miracle. The Minister General of the Franciscan Order, Father Carlo Vipera, examined the Hosts on April 14, 1780, and upon tasting one of them he found it fresh and incorrupt. Since a number of the Hosts had been distributed during the preceding years, the Minister General ordered that the remaining 230 particles be placed in a new ciborium and forbade further distribution. A more detailed investigation took place in 1789 by Archbishop Tiberio Borghese of Siena with a number of theologians and other dignitaries. After examining the Hosts under a microscope, the commission declared that they were perfectly intact and showed no sign of deterioration. The three Franciscans who had been present at the previous investigation, that of 1780, were questioned under oath by the Archbishop. It was then reaffirmed that the Hosts under examination were the same ones stolen in 1730. As a test to further confirm the authenticity of the miracle, the Archbishop, during this 1789 examination, ordered several unconsecrated hosts to be placed in a sealed box and kept under lock in the chancery office. Ten years later these were examined and found to be not only disfigured, but also withered. In 1850, 61 years after they were placed in a sealed box, these unconsecrated hosts were found reduced to particles of a dark yellow color, while the consecrated Hosts retained their original freshness. Other examinations were made at intervals over the years, the most significant being that of 1914, undertaken on the authority of Pope St. Pius X. For this inquiry the Archbishop selected a distinguished panel of investigators, which included scientists and professors from Siena and Pisa, as well as theologians and Church officials. Acid and starch tests performed on one of the fragments indicated a normal starch content. The conclusions reached from microscopic tests indicated that the Hosts had been made of roughly sifted wheat flour, which was found to be well preserved. The commission agreed that unleavened bread, if prepared under sterile conditions and kept in an airtight, antiseptically cleaned container, could be kept for an extremely long time. Unleavened bread prepared in a normal fashion and exposed to air and the activity of micro-organisms would remain intact for no more than a few years. It was concluded that the stolen Hosts had been both prepared without scientific precautions and kept under ordinary conditions which should have caused their decay more than a century before. The commission concluded that the preservation was extraordinary, "…e la scienza stessa che proclama qui lo straordinario." The holy Particles of unleavened bread represent an example of perfect preservation … a singular phenomenon that inverts the natural law of the conservation of organic material. It is a fact unique in the annals of science. In 1922 another investigation was conducted -- this one in the presence of Cardinal Giovanni Tacci, who was accompanied by the Archbishop of Siena and the Bishops of Montepulciano, Foligno and Grosseto. Again the results were the same: the Hosts tasted like unleavened bread, were starchy in composition and were completely preserved. In 1950 the miraculous Hosts were taken from the old ciborium and placed in a more elaborate and costly one, which caught the eye of another thief. Thus, despite the precautions of the clergy, another sacrilegious theft occurred on the night of August 5, 1951. This time the thief was considerate enough to take only the container and left the Hosts in a corner of the tabernacle. After counting 133 Hosts, the Archbishop himself sealed them in a silver ciborium. Later, after being photographed, they were placed in an elaborate container which replaced the one that had been stolen. The miraculously preserved Hosts are displayed publicly on various occasions, but especially on the 17th of each month, which commemorates the day they were found after the first theft in 1730. On the feast of Corpus Christi the Sacred Hosts are placed in their processional monstrance and triumphantly carried in procession from the church through the streets of the town, an observance in which the whole populace participates. Among many distinguished visitors who have adored the Hosts was St. John Bosco. They were likewise venerated by Pope John XXIII, who signed the album of visitors on May 29, 1954, when he was still the Patriarch of Venice. And although unable to visit the miraculous Hosts, Popes Pius X, Benedict XV, Pius Xl and Pius Xll issued statements of profound interest and admiration. With a unanimous voice, the faithful, priests, bishops, cardinals and popes have marveled at and worshiped the holy Hosts, recognizing in them a permanent miracle, both complete and perfect, that has endured for over 250 years. By this miracle the Hosts have remained whole and shiny, and have maintained the characteristic scent of unleavened bread. Since they are in such a perfect state of conservation, maintaining the appearances of bread, the Catholic Church assures us that although they were consecrated in the year 1730, these Eucharistic Hosts are still really and truly the Body of Christ. The miraculous Hosts have been cherished and venerated in the Basilica of St. Francis in Siena for over 250 years. Pope Francis has sent the following telegram of condolence to the family of Cardinal Domenico Bartolucci, who died today at 96 years of age. He was a former director of the Sistine Chapel Choir who was created a cardinal by Pope Benedict XVI in the consistory of 20 November 2010. 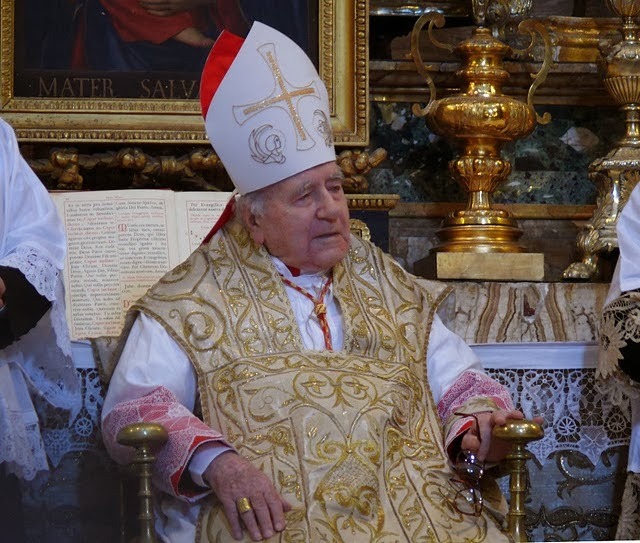 “Upon receiving the news of the death of the venerated Cardinal Domenico Bartolucci, I wish to express to the foundation that bears his name, to his family and his Florentine diocesan community my most heartfelt condolences. I recall affectionately this dear and highly esteemed priest, an illustrious composer and musician, who exercised his long and intense ministry, especially through religious music, born of and expressing faith. I also remember with great gratitude his fruitful work as director of the Sistine Chapel Choir and his wise … of the precious gift of polyphony, intended to elevate the heart in praise of God. I raise fervent prayers to the Lord that, through the intercession of the Blessed Virgin Mary, He may welcome his generous servant and distinguished man of the Church in spiritual joy and eternal peace, and impart the comfort of an apostolic blessing to those who mourn his loss”.Cardinal Bartolucci's funeral will be celebrated on 13 November at 3.30 p.m. at the altar of the Chair of St. Peter in the Vatican Basilica. With his death, the College of Cardinals is now composed as follows: 200 cardinals, of which 109 are electors. Pope Francis, through the Pontifical Council “Cor Unum” has decided to send an aid contribution of 150,000 dollars to assist the population of the Philippines, devastated by the passage of the typhoon Haiyan which violently struck the country this weekend, in particular affecting the islands of Leyte and Samar and causing, according to unconfirmed estimates, more than ten thousand deaths. This sum, which will be distributed by the local Church in the regions most affected by the disaster, will be used to support aid work for the assistance of displaced persons from the flooded areas, and it is intended as a first and concrete expression of spiritual nearness and paternal encouragement on the part of the Supreme Pontiff in relation to the people and territories devastated by the floods. 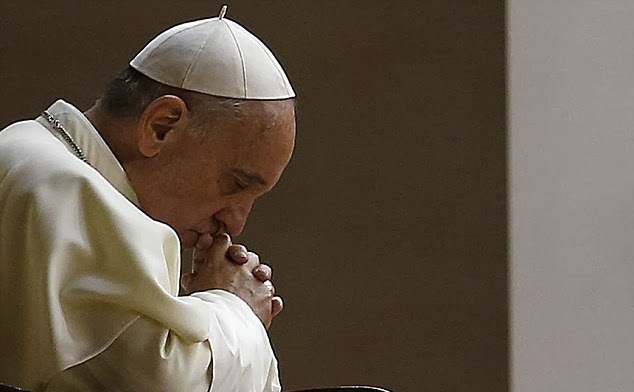 Pope Francis has sent a telegram of condolence to the President of the Philippines, expressing his solidarity with those affected by Typhoon Haiyan. The typhoon, one of the worst on record, is feared to have killed as many as 10.000 people on Leyte island, which bore the brunt of the storm.